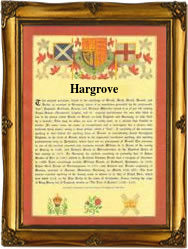 Recorded as Hargrave, Haregrave, Hargreave, Hargrove, Hargraves, Hargreaves, and possibly others, this is an English Surname. It is locational from any of the various places in Cheshire, Northamptonshire, and Suffolk called Hargrave or Hargreave, and recorded in the famous Domesday Book of 1086. The placenames are derived from the Olde English pre 7th century "hara" meaning a hare, although possibly a personal name, and the suffix "grafe", meaning a thicket or wood. Locational surnames were developed when former inhabitants of a place moved to another area, usually to seek work, and were best identified by the name of their birthplace. This surname is 12th Century (see below), making it one of the earliest on record. An early settler in the New World was Richard Hargrave, aged 20, who embarked from the Port of London on the ship "Bonaventure", bound for Virginea in January 1634. A coat of arms associated with the name has the blazon of Azure, a fesse ar, getween three stags in full course or. The first recorded spelling of the family name is shown to be that of Geoffrey de Haregrave. This was dated 1188 in the Pipe Rolls of Derbyshire, during the reign of King Henry 11nd of England, 1154 - 1189. Surnames became necessary when governments introduced personal taxation. In England this was sometimes known as the Poll Tax. Throughout the centuries, surnames in every country have continued to "develop" often leading to astonishing variants of the original spelling.